Hydroxyl Radical Antioxidant Capacity (HORAC) Assay | Cell Biolabs, Inc. 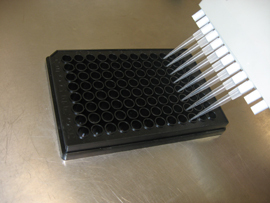 The HORAC assay is a powerful tool to measure the antioxidant capacity of biomolecules. Our OxiSelect™ HORAC Activity Assay measures the degradation of free hydroxyl radicals in less than 2 hours from a wide variety of sample types. Figure 1: Assay Principle for the OxiSelect™ HORAC Activity Assay. Please see product manual for detailed calculations. Gardner, A. W. et al. (2016). Association between gait characteristics and endothelial oxidative stress and inflammation in patients with symptomatic peripheral artery disease. AGE (Dordr). doi:10.1007/s11357-016-9925-y. Jeong, M. H. et al. (2014). In vitro evaluation of Cordyceps militaris as a potential radioprotective agent. Int J Mol Med. 34:1349-1357. Mishra, S. et al. (2014). Semiquinone glucoside derivative (SQGD) isolated from Bacillus sp. INM-1 protects against gamma radiation-induced oxidative stress. Environ Toxicol Pharmacol. 37:553-562. Gardner, A. W. et al. (2014). Gender and racial differences in endothelial oxidative stress and inflammation in patients with symptomatic peripheral artery disease. J Vasc Surg. 61:1249-1257. Gardner, A. W. et al. (2014). Greater endothelial apoptosis and oxidative stress in patients with peripheral artery disease. Int J Vasc Med. doi:10.1155/2014/160534. Gardner, A. W. et al. (2014). Impaired Vascular Endothelial Growth Factor A and Inflammation in Patients with Peripheral Artery Disease. Angiology. 65:683-690. Jeong, M.H. et al. (2014). Protective Activity of a Novel Resveratrol Analogue, HS-1793, Against DNA Damage in 137Cs-Irradiated CHO-K1 Cells. J Radiat Res. 55:464-475. J, M.H. et al. (2014). Protective Activity of a Novel Resveratrol Analogue, HS-1793, Against DNA Damage in 137Cs-Irradiated CHO-K1 Cells. J Radiat Res. 10.1093/hmg/ddt662. Gardner, A. et al. (2013). Impaired Vascular Endothelial Growth Factor A and Inflammation in Patients With Peripheral Artery Disease. Angiology. 10.1177/0003319713501376. Bailey-Downs. et al. (2013). Aging Exacerbates Obesity-Induced Oxidative Stress and Inflammation in Perivascular Adipose Tissue in Mice: A Paracrine Mechanism Contributing to Vascular Redox Dysregulation and Inflammation. J Gerontol A Biol Sci Med Sci. 68:780-792. Downs, L.C. et al. (2012). Aging Exacerbates Obesity-Induced Oxidative Stress and Inflammation in Perivascular Adipose Tissue in Mice: A Paracrine Mechanism Contributing to Vascular Redox Dysregulation and Inflammation. J Gerontol A Biol Sci Med Sci. 10.1093/gerona/ gls238. Bailey-Downs, L.C. et al. (2011). Liver-Specific Knockdown of IGF-1 Decreases Vascular Oxidative Stress Resistance by Impairing the Nrf2-Dependent Antioxidant Response: A Novel Model of Vascular Aging. J. Gerontol A Biol Sci Med Sci. 67A:313-329. Ungvari, Z. et al. (2011). Free Radical Production, Antioxidant Capacity, and Oxidative Stress Response Signatures in Fibroblasts from Lewis Dwarf Rats: Effects of Life Span-Extending Peripubertal GH Treatment. J. Gerontol. A Biol Sci Med Sci. 10.1093/gerona/glr004.